If you’re still producing content on a whim, then good for you! At least you’re producing content. But if you’re just banging-out the occasional blog post because you “had an idea” or just conjured-up the motivation, then now is a good time to create a content calendar. A content calendar is simply a schedule (often broken-down annually, quarterly, or monthly) that defines specific pieces of content and when they’re to be published. It’s proactive tool that helps ensure the completion of quality content in a mindful and strategic fashion. The SEO company I work for, Captivate Search Marketing, applies a nifty system for developing content calendars that are instructed by keyword data. It’s pretty easy to grasp. 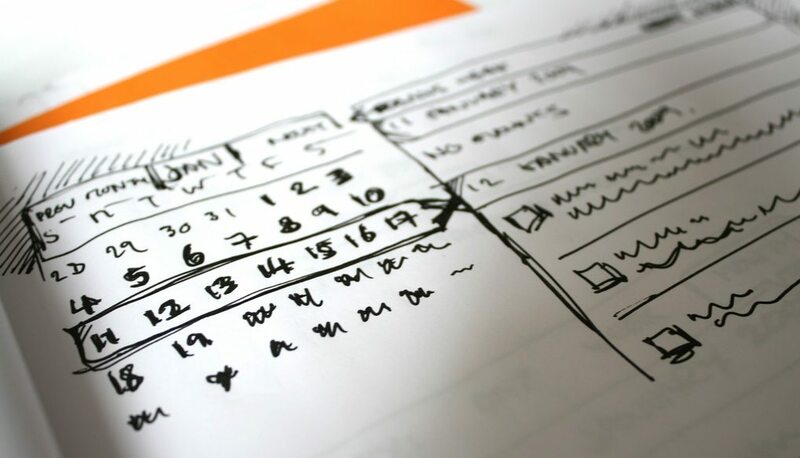 So below I share an simple exercise on how we create content calendars for better SEO. Most businesses and brands need help determining the subject matter or topics to make up their content strategy. In addition to creative brainstorming and conversations with clients, I use the Google Keyword Planner to cultivate ideas. The Keyword Planner is easy to use. Focus on pinpointing both short-tail and long-tail keyword phrases that represent the brand and its audience (and ultimately the content supporting both.) If you’re actively doing SEO, then you’ll find this exercise to be very natural. The first step of this exercise is to generate keyword data, review the findings, and select phrases that make the most sense for content creation. In this example, we’re trying to reveal insights surrounding a client’s target keywords surrounding “film transfer,” a service involving converting old film to DVD and other digital formats. During this phase of the exercise, the focus is to extract all keyword phrases that are relevant to the client and the future content strategy. 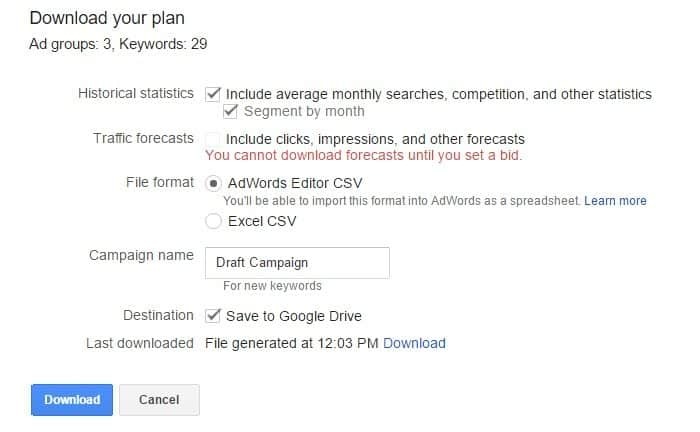 In other words, save keywords that seem relevant using the “Add to plan” option. We’ll refer back to the data in the next phase. Review the keyword ideas suggested by Google and add phrases that have significant meaning and relevance to your project. You can also hover over the bar graph icon next to each keyword to see annual search trend data. In the next step, we’re going to leverage this trend data to create our content calendar and schedule content when it’s most commonly searched. 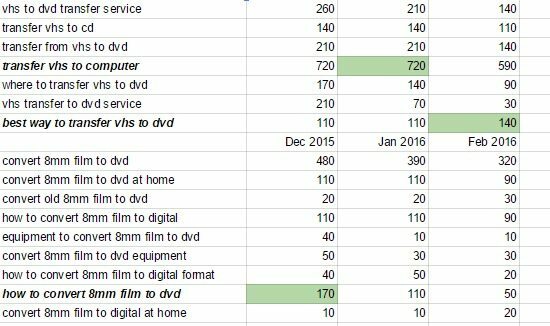 In the case of the keyword phrase “film transfer to DVD,” we can see that this query is most commonly searched in November – January. This could be because people want to convert their old film into a more accessible format during the holidays. If you’re taking the keyword research exercise to great lengths, a good way to keep your data organized is to create new “ad groups” or related keyword categories. This can make the data easier to absorb and analyze for future use. Once you’ve gathered enough keyword data, proceed to download this data into a spreadsheet where we can the analyze the data for our content calendar. There are several options when downloading the keyword data. 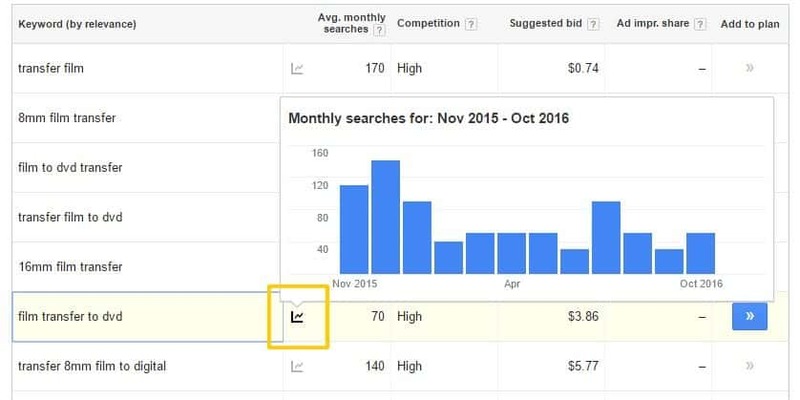 Make sure to check the box “Segment by month” in order to get monthly search volumes, and thus have the capabilities to analyze search trends. 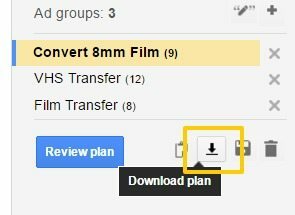 I also like to “Save to Google Drive” and work directly from Google’s spreadsheet interface. If you prefer to download the data to your files and use a different spreadsheet software program, then that’s fine too. When you open the keyword data spreadsheet, you’re going to see a lot of columns that are irrelevant to this exercise. I suggest formatting the spreadsheet in such a way that makes reviewing the data more efficient. And by formatting, I simply mean removing unnecessary rows and columns. For instance, I’ll often delete the first rows A – I, as well as the rows for “Keyword Type, Segmentation, Forecast quality, Impr. share, Organic impr. share, and Organic avg. position.” I’ll also delete columns 3-8 to tighten up the data. Keep in mind that there’s no right or wrong way to go about this exercise. The focus is to format the keyword data in such a way that you can interpret it with greater efficacy. The outcome should look something like the figure below: an organized list of phrases with monthly keyword data. The last phase of the exercise is to review the keyword data you’ve generated to pinpoint trends. First, look for keyword phrases that inspire good topics for content. These will often be long-tail phrases in which the searcher intent is to ask a question or seek a desired solution. In the figure below, I’ve selected a few keyword phrases that I believe would make for good content marketing topics for this particular client. While selecting keyword phrases, take into consideration the months in which each particular phrase is searched most often. I will highlight months that offer the greatest search volume in an effort to maximize the SEO traffic potential for each piece of content. This, in a nutshell, can serve as simple, SEO-driven content calendar. 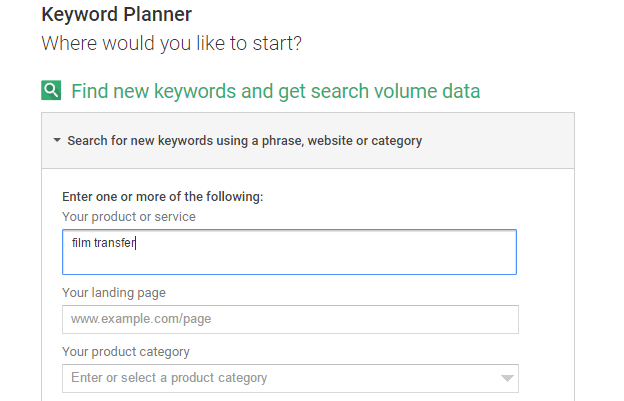 Now you could go the extra mile by further organizing your keyword selections and monthly search volume into another format. We do this for our clients’ content calendars to clearly present the data and the topics we pitch to them. In short, the outcome is content calendar briefing that instructs the creation and publishing of each piece. In a related post, I outline specific techniques in which you can use to infuse SEO into your content (without mucking-up the quality of the content or user experience.) Check it out for more insights on how to maximize organic search traffic for your content marketing efforts.